Having a lovely backyard area can be a place of great memories for you and your family. Your children can embark on their own adventures together, while the adults are able to sit back, relax, and enjoy the weather. Having a pool to compliment this backyard area is a great idea, especially in an area like Phoenix, where the heat can be very intense if you don’t have an area to cool off. Are you in the market to install a pool? Do you want to update and transform your backyard into an area of entertainment and leisure? 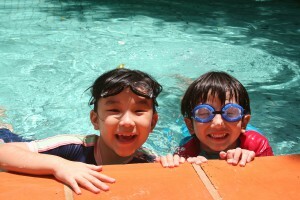 When searching for pool companies in Phoenix, look no further than No Limit Pools. At No Limit Pools, we understand that it can be overwhelming to look at an unfinished or familiar space and figure out exactly what it is you want to do. What makes us stand out compared to other pool companies in Phoenix is that we take the time to meet with you in person, and figure out your goals with your pool project. We understand that pool and outdoor construction is a serious investment, and we want to include you through every step of the process. Our team of pool builders is dedicated to helping you transform your backyard dreams into a reality. We will go over pool construction materials, such as gunite, fiberglass, and vinyl, and explain the pros and cons associated with each. For example, vinyl is the cheapest option out of the three building materials. However, it also requires the most maintenance, and must be replaced every five years or so. Gunite, on the other hand, is the most customizable and durable, but its initial cost is more expensive. We will make sure to go into further detail regarding these pool materials and decide what the best option is for you. Once that is taken care of, our pool builders will discuss the purpose of your swimming pool. While this may seem like a simple question, your answer can have a big impact on how your pool is designed. For example, if your pool is going to be used mostly by your children, then we would want to design a pool that is relatively shallow, has a small shape, and is easily accessible in case of any emergency. On the other hand, if you want to use your pool for exercise activities, then you would most likely want a pool shape that is deep, long, and narrow in order to swim laps effectively. These attentions to detail is what helps separate us from other pool companies in Phoenix. The last step of the pool construction process will be about water features. Would you like a waterfall to add a natural feel to your pool and backyard area? This is a great and common water feature that really helps bring a backyard to life. Other water features include fountains, spas, and even tanning ledges. We will go over water features you want, or are thinking about down the road. That way, we can design your pool in a way that will make the water feature installation very simple. While we take great pride in our pool customization abilities, we also provide a highly customizable landscaping service. A lot of pool companies in Phoenix won’t deal with outdoor landscaping features, but we understand that your backyard dream destination wouldn’t be complete without a beautiful backyard to complement your pool. We can help you create the outdoor kitchen of your dreams; one that includes all of the kitchen appliances and dining room seating that you need in order to entertain guests. After dinner has been served, wouldn’t it be nice to gather around an outdoor fireplace and enjoy a nice bottle of wine with your guests? We can provide you with all of that! If you’re in the market for pool companies in Phoenix, look no further than No Limit Pools. We enjoy creating custom designed backyards that fit our customer’s personality and needs. We understand that this process can be very overwhelming, so we will work with you to come up with the best ways to get your backyard dream out into the real world. Let us take the guesswork and stress out of your next project. This is why we’re one of the top pool companies in Phoenix. Call us today at 602-421-9379, or visit our website, and let’s see what we can do to help you.